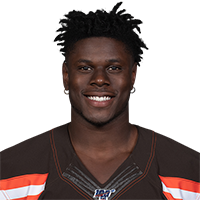 Published: Nov. 25, 2018 at 05:13 p.m.
Cleveland Browns quarterback Baker Mayfield finds tight end David Njoku who is carried by his team into the end zone on a 6-yard touchdown. Published: Oct. 21, 2018 at 02:54 p.m. Published: Oct. 14, 2018 at 03:51 p.m.
Cleveland Browns quarterback Baker Mayfield throws a jump ball and tight end David Njoku reaches over the Los Angeles Chargers defender for a 1-yard touchdown.